In most cases, you can provide your own knee pain relief with these exercises for chondromalacia patella knee pain. Most often, the solution is not complicated. Just follow along with the videos below. These exercises are broken down into simple steps that you can do at your own pace. "Wow i did all the exercises of the 4 vids and it took away the pain in an instant, i'm so happy..." Diana. "Thank you for everything that you do and provide to us!!! Since finding your site and videos I've been able to ELIMINATE all my joint pain. I had two hurt knees, a painful right shoulder, a really painful pinched or pulled nerve/muscle (something haha) in my middle/upper back, and I guess my ITB was tight giving me "snapping hip syndrome". You helped me more than any doctor I've been to, more than anyone else, and I thank you for that." G.
No matter how you spell it, chondromalacia patella is simply the improper tracking of the patella (knee cap) bone on the front of your knee. 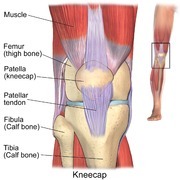 It leads to inflammation, pain, and ultimately wear and tear on the knee joint. The good news is that it is usually prettyy easy to fix it. And most often you can do it yourself. If you think of all the muscles in your body like the rigging (ropes) on a big old-fashioned sailboat, you can imagine that if some to the rigging (muscles) became inappropriately tight then they would pull things out of position, which would cause them not to work properly. Chondromalacia is usually caused by some of the muscles on the front of your thigh being too tight. The muscles that are too tight yank on your knee joint and throw off it's proper alignment. When the joint functions without being properly aligned it's like gears trying to work without being properly aligned. The job they are doing may still get done, but there will be a lot more wear and tear on the joint than if things were aligned properly. But I'm going to show you how to fix that. These exercises for chondromalacia patella are designed for anyone to be able to do. Again, just take your time and you'll do fine. These exercises for chondromalacia patella knee pain may instantly relieve your pain from doing just Step 1. But please continue through this entire series so your pain relief can be stable and long lasting. This technique is great for individuals with pain on the front, and/or side of their knee, either lateral or medial. We are going to use the hand-on-hand technique to release the belly of the muscle that may be pulling on its tendon and causing your knee joint pain. Sit in a chair or on a stool. Take your fingertips from your dominant hand and place it on your leg, six to eight inches above the spot on your knee that hurts. If the knee joint pain is on the outer edge of your knee then you put your fingertips six to eight inches above that spot on the outer side of your leg. If the knee joint pain is on the front of your knee then you put your fingertips six to eight inches above you kneecap on your thigh. If your knee joint pain is on the inner edge of your knee then put your finger tips six to eight inches above that on your inner thigh. Press with your fingertips into the tissue and notice any tender spots. From your original spot press around in this area 3 inches to the side each way and down to your knee. Notice any tender spots in that entire six inch wide and eight inch long area. And now, as I do in the video above, use the press-pull-release technique and the hand-on-hand technique to release any tight tissue you locate. You can also mix in some of the press-hold-move technique if it's possible for you to perform it. If you're so inclined you can work higher up on your leg as well, but most often you'll get relief from working on the lower half of your thigh and sides of legs. Notice how much these exercises for chondromalacia patella knee pain are working for you in terms of pain relief. As we continue with more of these these exercises for chondromalacia patella knee pain you'll be doing many the same techniques you learned in Video 1, just on different areas of your body. Now do the exact same "hand-on-hand" technique as in Step 3A and 3B (just above) except on the very side of your leg (iliotibial band). You can also try lying on your side while you do this with the side you are working on facing the ceiling. On the very side of your leg (your IT Band) I like to use the press-pull-release technique with an assist from the hand-on-hand technique to release all the tissue up the side of my femur. And I like to use the tennis-ball-press technique along with the press-hold-move technique on your tensor fascia latae muscle on the top outside edge of your hip. Notice how much these exercises for chondromalacia patella knee pain are working for you.. Your inner thigh muscles (adductors) attach to the bones on the medial side of your knee joint. Freeing these muscles helps balance the knee joint. Sit in a chair and cross your leg with the knee pain over your other leg so your ankle is resting on your thigh. Press with your fingertips into the tissue of your inner thigh and notice any tender spots, especially in the lower half of your inner thigh. Now with both of your thumbs OR using the hand-on-hand technique do the press-pull-release technique on any tender spots. If you encounter a particularly stubborn spot, feel free work on another spot for a little while and then return to the stubborn spot again. Take your time and be persistent and the tissue will let go. 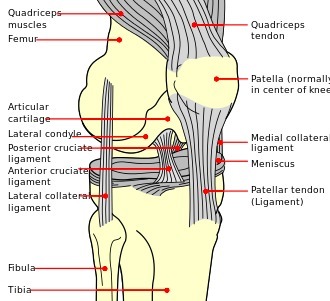 Notice how much these exercises for chondromalacia patella knee pain are working for you, and how much pain relief this one technique provides for future reference. Sit on the floor with your legs are far apart as possible, with your toes pointed toward the ceiling. Position yourself in front of the leg of a couch, large table, or anything you can reach forward and grab with your hands. Grab the object in front of you and slowly pull your upper body forward. You should feel the stretch in your inner thighs. Hold for 10 to 20 seconds and then release. Do one set of three. Repeat this three more times. If your knee joint pain is on the medial side (the side closest to your other knee) then do this stretch until you notice substantial change in your flexibility. You can't do this stretch too much as long as you take your time and go slowly. This is a classically grear place to use the press-hold-move technique and the hand-on-hand technique to release your front shin muscle. Once you find some tender/painful/tight tissue, just flex your foot up and down. You will feel the muscle flexing under your fingertips as you press and flex your foot up and down. Did these exercises for chondromalacia patella knee pain work for you? The stretch I show you in this video is pretty straight forward. Just always maintain straight legsand always flex those thighs as hard as you can while performing this stretch. Notice how much these exercises for chondromalacia patella knee pain are working for you? I do have an entire page on this technique here: Pain In Back of Knee for those interested, but this pretty straight forward. You want to be somewhat gentle with this tissue on the back of your knee joint, but you still want to be firm enough to release it. So using mostly your thumbs, just mix and match with the press-pull-release technique and press-hold-move technique to get any tight tissue to let go. Notice how much these exercises for chondromalacia patella knee pain are working for you. My brand new super duper Best Calf Stretches (click here) page will answer any further questions you may have. And it will give you one more calf stretch that I do not cover in this video. Mostly, just remember to do this stretch slowly and you should be fine. Go slowly. Go slowly. Notice how much these exercises for chondromalacia patella knee are working for you. Take the foot you want to work on and cross it over your other knee, so you can access the bottom of your foot with your thumbs. You're now in the perfect position to do the press-pull-release technique with any tight tissue you find. Flex your toes up and down while you press on tight tissue and you'll be adding the press-hold-move technique to the mix, which is great. Notice how much these exercises for chondromalacia patella knee are working for you.. Remember that the goal of both of these stretches is release the bigger muscle groups on your hips, so that your knee is more free to function properly. These stretches are great because the positions of your legs allows you to get leverage on those muscles that you don't usually get in daily life. And while I'm a big fan of these stretches and do them regularly myself, do feel free to check out my Pelvic Girdle Pain Relief (click here) page where I show you how to alternate the stretches and the tennis-ball-press technique to maximize your results. Notice how much these exercises for chondromalacia patella knee pain are working for you, and how much pain relief these stretches provide you. After doing these exercises for chondromalacia patella knee pain relief, is your pain completely gone? Partially gone? Which exercises for chondromalacia patella gave you the most pain relief? Of ALL the exercises for chondomalacia patella, was there ONE particular exercise that instantly relieved your pain? Remember what worked best for you, so you can do that first next time the pain occurs. Despite doing ALL the exercises for chondromalacia patella, are you still experiencing some mild patella chondromalacia pain? Investigate a bit and you'll eventually find which techniques work best for you to provide the patella chondromalacia treatment you desire. Then you'll be able to fix yourself whenever you desire because you'll the exercises for chondromalacia patella that work for your individual body……literally at your fingertips!